Drilless Dentistry | Blue Island, IL | Laurie S. Gordon, D.D.S. Dental drills are not the only solutions for removing tooth decay. A newer method called air abrasion is an alternative to the dental drill. 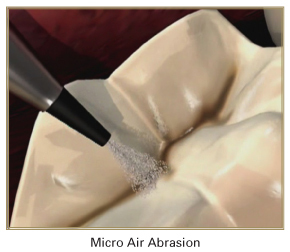 Air abrasion "sandblasts" the tooth to removed tooth decay and enamel. Many patients' fear of the dentist stems from the noise or vibrations from the drill used to treat tooth decay. With virtually pain-free air abrasion, the dentist sprays the tooth with a mix of air and powder. There is generally no need for anesthetic with this new technology. It eliminates the noise and vibration associated with the dental drill. There are limitations to the use of air abrasion and the dentist will recommend this option when it is appropriate. At our office,you can enjoy a more comfortable dental appointment...without the need of noisy drills!